For the past 40 years you’ve heard that fat, and especially saturated fat, is not good for your health. And that might make sense: after all, fat is often a cause for various health concerns. Carrying a large portion of body fat is not healthy, but it’s not dietary fat that’s making you unhealthy, at least not for the most part. In fact, most dietary fat is very healthy for you. Other than trans-fats and omega-6 fats, dietary fat is healthy and does not contribute to weight gain, hypertension, diabetes, heart disease, obesity, and a number of the conditions you have been led to believe it does. And what about cholesterol, the stuff that makes fat and saturated fat so bad for you? Well, as it turns out, that’s grossly misunderstood, too. Last week, a top advisory panel suggested that the U.S. Department of Agriculture (USDA) rescind its current recommendations to limiting fat intake to 30% and saturated fat to 10% of total daily calories. Now, the USDA can reject this recommendation, and it very well might—but not because fat has been repeatedly found to be safe (except for trans fats). Rather, the USDA may alter its recommendations due to the size and scope of the grain and sugar industry—largely the production of corn. The advisory board’s results are similar to those of previous studies that indicate fat and saturated fat are no cause for concern and do not significantly affect the risk of cholesterol in the blood, nor do they increase your heart attack risk. In fact, a recent meta-analysis indicated that these restrictions on fat intake should have never been introduced in the first place! If you’re a regular reader of Doctors Health Press, you likely know by now that there are two types of cholesterol: “good” cholesterol, which is high-density lipoprotein (HDL) cholesterol, and “bad” cholesterol, which is low-density lipoprotein (LDL) cholesterol. LDL is labeled “bad” because it can accumulate in your arteries and cause blockages. As a result, this can lead to high blood pressure, heart disease, and an increased risk for heart attacks or strokes. Saturated fat is high in total cholesterol and LDL cholesterol, which may be why it’s negatively associated to overall health. But here’s the rub: there are two kinds of LDL cholesterol. 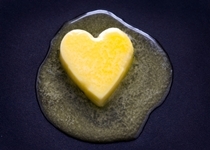 Saturated fat is high in type-A LDL. Type-A LDL floats freely in your blood stream and is too big and buoyant to deposit in your blood vessels and cause blockages or thicken your arteries. This cholesterol makes up 80% of LDL and has no impact from a cardiovascular standpoint. In other words, it is not bad. The type of LDL cholesterol that actually is bad for your health is type-B LDL. Type-B LDL is small, dense LDL that settles in your bloodstream to block and thicken arteries. Of course, this is what leads to the aforementioned health problems. This type of LDL, however, is not a byproduct of excess fat intake; rather, it’s caused by carbohydrates—refined sugars specifically! There are seven different types of fat. Here’s what they are, in order from the most beneficial to the least beneficial in terms of your health. As you’ll see, of the seven, only two cause harm. 2. Monounsaturated Fats: These fats stimulate liver metabolism and reduce artery-clogging LDL. Some natural sources of healthy monounsaturated fats include almonds, olive oil, canola oil, walnuts, and avocados. 3. Polyunsaturated Fats: These are found in vegetable oils, including corn, sunflower, and soybean oil, and some fatty fish. They are anti-inflammatories, but if too much polyunsaturated fat is consumed, it can lead to problems with your immune system. They are, however, classified as good fats. 4. Saturated Fatty Acids: These fats are found in grass-fed animal meats, and milk and dairy products. They raise type-A LDL (the neutral kind of LDL cholesterol) to very high levels and are only dangerous to those with a specific genetic condition called FH. 5. Medium-Chain Triglycerides (MCTs): Examples of MCTs are palm oil, coconut oil, and palm-kernel oil. They are a good source of energy, but there is some evidence to show they can cause arterial blockages when consumed in excess. So as you can see, you might want to stick to butter instead of coconut oil for healthy cooking! 6. Omega-6 Fatty Acids: This is where fats start to get a little messy, because carbohydrates show up. Omega-6 fatty acids are found in farm-raised animals that are fed corn and soy products. These fats are associated with insulin resistance, arterial hardening, immune dysfunction, and inflammation. 7. Trans-Fats (Partially Hydrogenated Oils): These are the fats that must be avoided. These are synthetic and only found in processed food. They are unnatural fats made in a laboratory. They are responsible for non-alcoholic liver disease and atherosclerosis. As you might have noticed, numbers 6 and 7 are the only fats that cause real health damage and add no benefits to your health. One of them is the result of animals being fed high-carbohydrate diets so they pack on the pounds and produce more meat, while the other is created in a lab. Since the 60s (or even earlier), it’s been clear that fat is not unhealthy. Inuit populations used to live almost entirely off of fat and rarely experienced the health problems for which a high-fat diet has been blamed. Furthermore, one only needs to look at the beginning of the obesity epidemic to see the real culprit: processed foods and sugars. When food companies were told to reduce fat usage, they replaced the flavor by introducing all kinds of sugar and high-fructose corn syrup to the recipe. The result: a global explosion in obesity and overweight individuals. For more information on the increase in sugar and foods packed with high-fructose corn syrup—and to see who’s the culprit behind this shift—see: Playing Politics with Your Food, Part 1: America’s Sugar Stockpile and Playing Politics with Your Food, Part 2: Big Bucks Supporting Sugar. Whoriskey, P., “The US Government is poised to withdraw longstanding warnings about cholesterol,” Washington Post web site, February 10, 2015; http://www.washingtonpost.com/blogs/wonkblog/wp/2015/02/10/feds-poised-to-withdraw-longstanding-warnings-about-dietary-cholesterol/. Lustig, R., Fat Chance: Beating the Odds Against Sugar, Processed Food, Obesity, and Disease (New York: Penguin Group, 2012), 105–116. Mollica, M., “Dietary Guidelines on Fat Intake – were there ever any evidence to support the low-fat recommendation?” BrinkZone.com web site, February 14, 2015; http://www.brinkzone.com/general-health/dietary-guidelines-on-fat-intake-were-there-ever-any-evidence-to-support-the-low-fat-recommendation/.